Western States Amass Forces in Syria 5 out of 5 based on 4 ratings. 4 user reviews. The US deployed special operation forces in order to support the advance of the premodninantly Kurdish Syrian Democratic Forces (SDF) in Northern Syria. In 2015 there were reports that US servicemen were building an air base in the Syrian Kurdish region of Hasakah. The US dened claims. However, now, it’s clear that the air base operates, providing arms and supplies to the units clashing against ISIS near Manbij. France’s Defense Ministry admited the presence of its special forces on the ground in Syria on June 9. According to report, French troops assist US troops and SDF units in operations near Manbij. The same force will likely participate in a long-expected advance on Raqqa, if it’s started, at least. Now, France is building a military base near the city of Kobane in Syria’s Aleppo province. The infromation is confirmed by a wide range of Kurdish sources. Meanwhile, warplanes of the US-led coalition against ISIS have been continuing to conduct airstikes all around Syria. All these forces have been deployed and now they operate in the Arab country without any request or authorization from the Syrian government. Separately, there were reports about Turkish troops among the militant groups, operating in Northern and Central Syria. According to experts, Turkish military advisers have been providing strategic planning and other support to Al Nusra and Ahram al-Sham at least since the middle of 2015. Turkish officers hold major ranks in these terrorist groups. This is only the top of the iceberg, but it allows to condlude that the US and its allies are amassing forces in Syria, preparing to set a puppet government on occupied areas of the Arab country, if the plan to owerthrow the legal Syrian authorities with proxy forces is failed. Do you want to know more about the US “Plan B” for Syria? Here, it is. The video below were initially posted at southfront.org on December 15, 2015. However, the recent events depict that it explains clearly the development of the ongoing Syrian war. The recent developments show significant changes in the strategy of the Western countries involved in the Syrian conflict. The US has sent ground forces, including special operations units, into the region. French Air Force has sharply increased the number of sorties, and France’s rapid-reaction troops and naval units are being moved closer to Syria. The United Kingdom has also begun to participate in the US-led anti-ISIS coalition strikes on Syrian soil. Likewise Germany has begun to deploy its aircraft and relocating almost 1200 quick-reaction troops to the Syria-Iraq battlefield. Turkey is deploying a large military attack force, including a number of armored units, at the border with Syria. It seems that NATO powers have realized the strategy aimed at Assad’s ouster by a diverse range of militant groups including ISIS which is backed by Turkey and the US has failed. According to the initial scenario implemented by the West, ISIS and other militant groups, deceitfully called the moderate opposition, were to carry out a Libya-like scenario in Syria and oust or preferably kill Assad and plunge the whole country into chaos. Then the US-led coalition would start a full-scale military operation to stop the terrorists threatening the “moderate opposition” in Syria, deploy NATO forces on the ground and take control of the crucial oil and logistic infrastructure. Western oil corporations supported by NATO would then restore the state of affairs as it existed more than 40 years ago. Syria would fall victim to total exploitation by overseas powers. The Mediterranean would become Alliance’ internal lake. Now it’s clear that Syria won’t fall under terrorist group pressure. The Syrian forces backed by Russia and Iran are gaining momentum, recapturing cities and facilities earlier controlled by militants. The NATO allies urgently need a new plan to hold control at least of the northern oil corridor from Iraq and try to take advantage of this opportunity to involve Russia in a long expensive war, in other words, to accomplish that which they failed to do in Ukraine. It means that the NATO contingent must occupy crucial infrastructure including oilfields before the Syrian government forces liberate it. Anti-government, meaning anti-Russian and anti-Iranian, forces would be established in parts of divided Syria. The need for an excuse to implement the changed approach could be the reason why the Nov.13 Paris attack wasn’t prevented by the Western special services. 1) Military buildup and escalation in the region could lead to open military conflict between NATO and the alternative anti-ISIS coalition that is led by Russia. This regional conflict could easily lead to a global war. Moreover, Turkey, a NATO member state, has already shown that it’s ready to escalate the situation to defend its illegal oil business linked with ISIS. 2) If the Syrian Arab Army with support by militia forces, Iran, and Russia isn’t able to show a significant success on the battlefield, Syria could be easily divided by the Western-backed ground forces supported by NATO airpower and intelligence assets. A direct military intervention to take control of the oil structure and crucial logistical points also remains possible. Even if NATO and its regional allies successfully take control of a significant part of the country, this escalation is unlikely to be avoided. The situation will become more acute due to the establishment of an aggressive puppet regime on the Syria’s territory. Considering that the alternative anti-ISIS coalition won’t lay down its arms, an open conflict could be easily provoked by the interested powers. 3) If the Syrian government forces supported by Russia and Iran take control of the country’s key areas, the US-led coalition will face the fact that Syria is de-facto liberated from terrorist groups. It could prevent a direct military intervention by NATO. In this case, the NATO countries would strengthen their presence in Iraq and use it as a foothold to launch further destructive actions against Syria. However, it’s the safest scenario most likely to avoid a global escalation. Russia is going to have to make decision. To take them on or close shop and go home. They must of realised by now that there is no point in negotiating. With the US and the others who are in Syria illegally. That leaves them one option as all the US understands is force. I believe Putin has been stalling to buy Russia enough time to modernize their military and become economically independent. I think they’re almost ready, we may see a change in policies by october. Though I think their are some far fetched points in this analysis, some points are valid. A centrally unified arab, discriminating based upon religion, gender, ethnicity government will not be acceptable anymore to the SDF and the next civil war within Syria will be when someone tries to force arabism, gender inequality, sharia, dictatorship on the SDF and its components. If we compare to other Middle Eastern countries, the Assad government looks pretty moderate. Almost half a million dead, 4 million refugeers a broad, 8 million internally displaced, a lot of cities in ruins, a government controlling some 25 to 30% of its surface area and maybe 50%of population? Moderate? There are no ME countries in a worse position. ANd whose fault is that? the secular Syrian government or the western demons and their proxies? Syria was a peaceful, prosperous nation before the invasion, just like Iraq and Lybia. What are you talking about, lying imperialist shill. Insulting proves nothing except you both lacking proper arguments and you not being able to respect somebody who does not agree with you. Syria, Iraq, Somalia and Lybia are all failed states, destroyed by internal divisions. Yes, those internal divisions were enhanced by the stupidness of their regimes, by neighbouring countries wanting influence (turkey, ksa etc etc), by tribalism and also, to some and varying extent some western countries. That makes blaming the West hypocrytical if you do not first blame the other relevant actors. 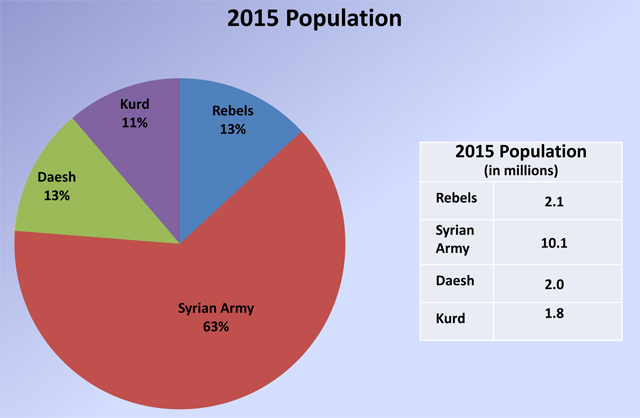 Assad controls 30% of territory and 10 millions of 15 of population. Internal refugees ran to Assad and not to FSA, Nusra, ISIS. Wow, a government controlling 30% of its territory. Even the SDF controls some 20%. Furthermore, a lot of IDP’s have and are running towards SDF areas. Mainly kurds, yes, but nowadays more and more arabs. The now some 5 million refugees outside of Syria will most likely mostly be opposition minded or just fed up with the whole of Syria. Syria as a state is ruined, politically, socially, morally, economically. Whether it can be reconstrued is an open question. In a way I admire those that still have the conviction it can be healed but some aspects of the old Syria – autocratic regime, discriminination of kurds, secret police etc – must not be allowed to return. A simple question, on whose authority or invitation are the above mentioned countries building,their military infrastructure on a another sovereign country’s territory. I would like to remind them that, such actions are an act of war, an open aggression under international law,to put it simply it’s an criminal act of aggression against Syria. The Syrian government should officially demand that those countries immediately leave the territory of the Syrian Arab Republic or else they will be concidered as aggressors and as occupational force, and by that standard will be dealt with in accordance with international law, or to simplify it thay will be fought against just as with the terrorists. Although this assessment is reasonable, a policy is necessary to address the intention of the anti-Assad bloc to prolong the conflict through ongoing proxy warfare operations (the objective of further destabilising Syria and engineering ‘another Afghanistan’ for Russia). – Consideration of applying a ‘responsibility to protect’ resolution relating to the population of Yemen (that is subject to a war of aggression which is creating a resultant humanitarian crisis) through the U.N.
– Visibly noticeable enhanced military/defence cooperation with Iran (joint defence exercises), etc….. Such policies would need to be examined but may prove to be effective in sending a message that actions (warfare/proxy warfare operations) have consequences. Many have forgotten the value of fear that serves to moderate behaviour. The Russian Federation has the capabilities to quietly remind them. It is self evident that until the spigot (facilitating the flow of arms and militants into Syria) is closed, the conflict will continue to be fuelled. The strategy of the anti-Assad bloc is to slowly bleed Assad aligned coalition forces and concurrently to engineer another Afghanistan for Russia, this intention being revealed through statements by various officials and the nature of active operations. As such, it is not only the militants that need to be targeted but also their sponsors need to experience consequences. The nature of such consequences should be calculated but adequate to modify behaviour (and serve as a potent deterrent) and clarify there are no actions without consequences. Unfortunately the retrained responses of the Russian Federation has only served to embolden adversaries. In this context, I would respectfully suggest Russian officials consider releasing a document that states if sponsors are proven to be involved in proxy warfare operations/support of terrorist groups, they will be held accountable for their actions (that constitute acts of war/ aggression). The message should be calm but clear. Upon establishment of proof, the Russian Federation would reserve the right to respond in a manner and time of its choosing . Various other mechanisms can also be employed (legal, economic/sanctions, etc. but I would suggest these would be ineffective). I would argue that responses short of clarifying ‘red lines’ will at best merely maintain the continuation of the conflict while at worst (and more likely) will see an intensification/expansion of proxy warfare operations. Calming the situation will not occur through conciliatory rhetoric. It will only be achieved through credible deterrence. P.S. A repetition of the Afghanistan scenario (an intention of the anti-Assad bloc) is not viable for the Russian Federation. A prolonged proxy war would in time result a Russian-coalition defeat (a military victory in Syria will not cease proxy warfare operations, now involving the provision of anti-aircraft missiles). As such, other mechanisms need to be applied to deter the parties involved in ongoing proxy warfare operations. These counter-measures need to present far greater security threats to the states involved in order to change their behaviour. This approach may seem too confrontational to some but the absence of credible/potent deterrents will only embolden adversarial actions (as is occurring). Furthermore, although Russian Federation policy is intended to avoid unnecessary escalation, if other parties are intent on confrontation/escalation (as is the case), escalation will occur. As such the Russian Federation is correct to take calculated counter-measures but prepare for such an escalation. The only thing I know for sure is that should it appear inevitable, it’s much better to start a new global war in Syria than on the border of Russia. It would be wise to open a couple of new ‘hot-spots’ in the depth of the enemy’s territory (Africa, Asia, Europe and South America) to force Americans stretching their lines of supply as it is possible while the bulk of the antifascist alliance (China, Russia, Iran + some other countries hopefully) will stay compact. Unfortunately, the chances of avoiding the WW III are dropping down significantly day by day thanks to the inability of the Western world to secure a sustainable development for their societies. The only way out of the dead-lock they see in a start up of a new major war on the global scale.